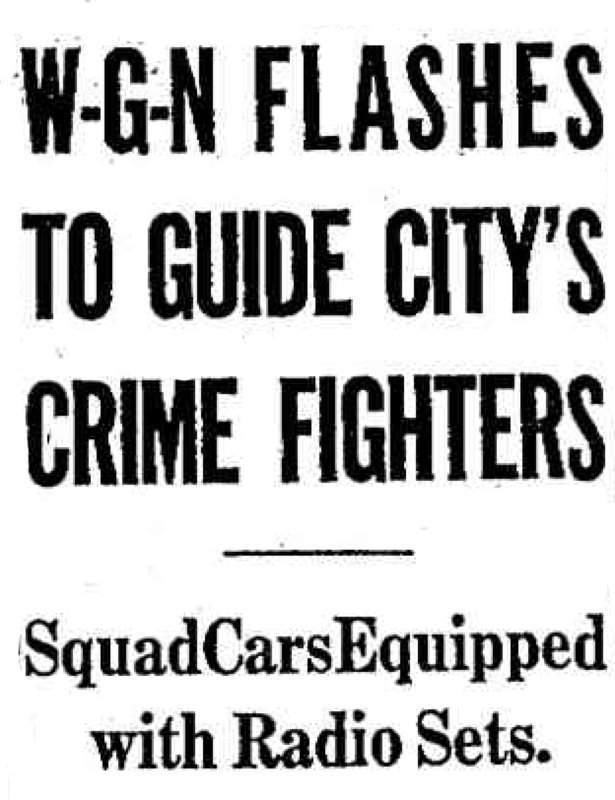 The first police radio in Chicago was broadcast publicly on WGN; however, the Chicago station was integrated into existing broadcasts rather than manufacturing an entertainment component. 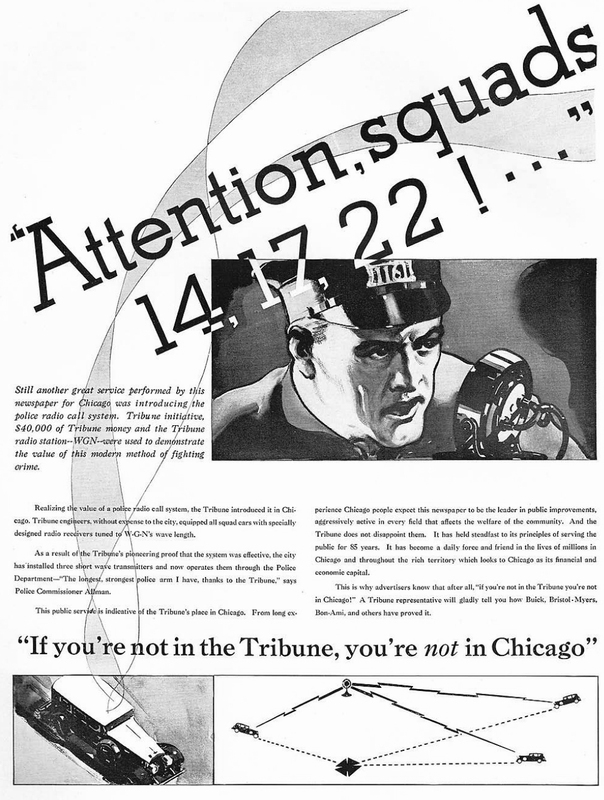 The first Chicago police radio messages were broadcast over WGN, whose programs were “interrupted several times each night and frequently during the day by emergency announcements.” This mixed style of broadcasting created major problems for the police, who had to contend with crowds of people, who, following the police broadcast, often showed up at crime scenes before the police and got in the way of their work. There were also reports that suggest that criminals followed police broadcasts to make easier getaways. Soon, police departments figured out ways to communicate their messages more privately, even if they were still available on public bands. In the early part of 1929, the assistant secretary of the Chicago Crime Commission, Mr. Frank Fisher, obtained permission from the Commission’s president, Mr. Loesch, to inspect the Detroit police radio system (the first in successful operation in the country). Upon his return, the Chicago Tribune sent one of its reporters, “Shadow” Brown, to interview Mr. Fisher. The result of the interview led to the authorization by Col. McCormick, of the Chicago Tribune, for the spending of $10,000 on police radio in conjunction with radio station WGN. The Tribune took up the matter with Commissioner William F. Russell, and several cars were equipped with receivers. Calls were given to “squads” through interrupted programs on WGN. The success of the system fanned the feeling that Chicago should have its own police radio system. The task of planning such a system demanded a great deal of investigation and research. To this end, the president of the Zenith Radio Corp. conferred with Commissioner of Police Russell and organized a group of engineers which later was known as the Technical Radio Advisory Committee. On July 10, 1929, the City Council authorized Commissioner William F . Russell to proceed with the purchase and installation of a police radio system. On June 16, 1930, a demonstration opening of Chicago’s first police owned radio station took place. Commander E. F. McDonald, Jr., president of Zenith Radio Corp., Col. Robert Isham Randolph, president of the Chicago Assn. of Commerce, police officials and more than a dozen aldermen who witnessed the demonstration voiced their approval. Five police squad cars, equipped with special receiving sets, carried the aldermen and others through the city in order to determine the efficiency of the system. To squads 1, 37A and 38A; Call Chief of Detectives John Egan’s office at once. In twi minutes one squad leader called from Wentworth avenue and 22d street; a half minute later another squad leader reported from Wieboldt’s store, School street and North Ashland avenue, where the squad was investigating a robbery described in another story on this page, and when another half minute had elapsed, the third leader, who had to walk five blocks to a telephone, called in from West Grand avenue and North Oakley avenue. The call was made as a test of the apparatus described below. Chief Egan pronounced the test a great success.